I hadn't been privy to Emily prior to receiving this book form the publisher and shame on me for that! I flipped through the book to glance at the artwork and immediately fell in love with her talent. Her website allows you to view numerous pieces of her artwork and comics - I really loved The Prince and the Sea - and got me even more excited to read this collection. 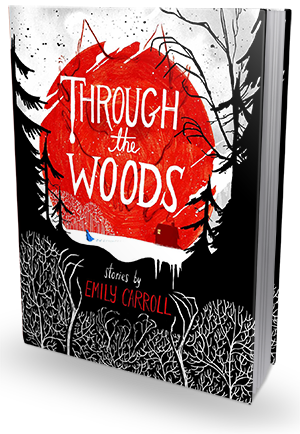 Through the Woods contains a series of short comics that are all equally creepy and gorgeous. Her artwork is simply amazing and while the comics themselves don't take long to read, you will absolutely get lost taking in the details of each page. Her art is filled with blacks, reds, and grays that add to the spooky atmosphere. Her dialogue is part of the artwork instead of the standard speech bubbles or blocks that are found in traditional graphic novels, which makes each page feel more like a work of art than a page from a graphic novel. Even the pages that contain mostly a black background with the characters in shades of gray are breathtaking to look at. The bonus of these pages is that she allows the reader to fill in darkness with their own imagination. Nice ominous line to end on, isn't it? Sleep well, darlings.